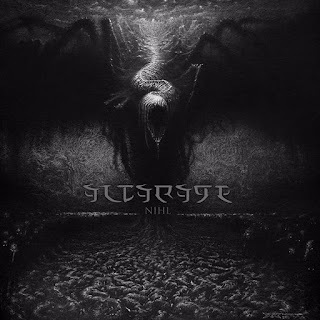 Altarage are a band from Spain that has been featured before in this zine and plays an avabt garde and bestial mixture of black and death metal and this is a review of their 206 album "Nihil" which was released by Sentinent Ruin Laboratories. A very harsh sound starts off the album before going into a very heavy and fast musical direction that also uses a great amount of blast beats and the fast riffs also use a great amount of tremolo picking and after awhile black metal screams make their presence known on the recording and the songs also bring in a great mixture of slow, mid paced and fast parts. A lot of war and bestial black metal elements can be heard in the bands musical style while the music is still very heavily influenced by the darker side of early 90's death metal and the songs also bring in a great amount of brutality while some songs add in a small amount of distorted drones and there is also a small amount of melody in some of the riffing along with some of the vocals using more of a growling approach and as the album progresses some of the slower sections of the songs bring in a touch of doom/death and the whole album also remains very heavy from beginning to ending of the recording. Altarage creates an album that takes war, black and death metal along with a touch of doom to create a very heavy and dark sounding recording, the production sounds very old school yet heavy while the lyrics cover darkness and occultism themes. In my opinion this is another great sounding album from Altarage and if you are a fan of avant grade, bestial black/death metal, you should check out this recording. RECOMMENDED TRACKS INCLUDE "Wormborous" "Vortex Pyramid" and "Cultus". 8 out of 10.